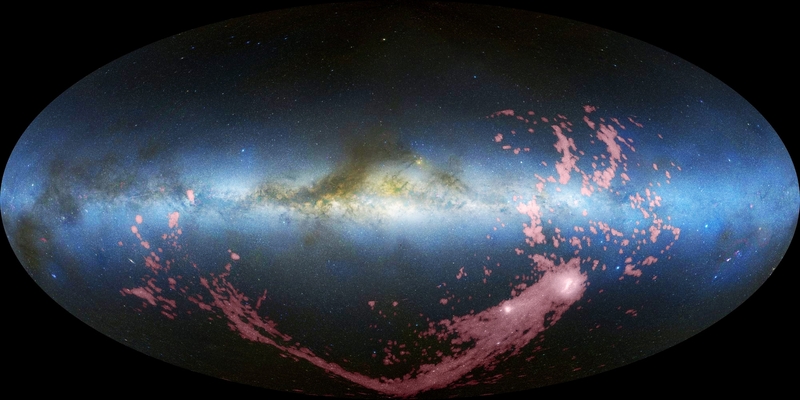 Mighty Magellanic Clouds: Gas (pink stream) spills out of the Magellanic Clouds (two white blobs at lower right) into a ribbon that wraps around most of the Milky Way, whose disk runs horizontally across the middle of this image. Credit: David Nidever et al., NRAO/AUI/NSF and Meilinger, Leiden-Argentine-Bonn Survey, Parkes Observatory, Westerbork Observatory, Arecibo Observatory. Our Galaxy, the Milky Way, is more than just a giant barred spiral harboring hundreds of billions of stars. It's also the hub of a gargantuan empire that stretches over more than a million light-years and rules some two dozen lesser galaxies, which revolve around it the way moons orbit a giant planet. Of all our Galaxy's many satellites, none compares with the Magellanic Clouds, which look like fragments of glowing mist torn from the Milky Way. Bold and beautiful, both galaxies are by far the liveliest and most lustrous of the Milky Way's retinue. In the last seven years, astronomers have discovered just how rare this galactic duo is—and how lucky we are to have the pair close by. Moreover, new observations from the Hubble Space Telescope have given us the best clue yet to their path through space, which holds the key to their unique nature. The Magellan galaxies, named for the Portuguese explorer Ferdinand Magellan and best seen from the Southern Hemisphere, turn out to be unusual in several ways. For their size, they possess a large amount of star-making gas and dust: more than a billion suns’ worth. Indeed, of the several dozen galaxies that belong to the so-called Local Group in our neighborhood of the cosmos, it's the Large Magellanic Cloud—not the much mightier Andromeda Galaxy or Milky Way—that boasts the greatest known stellar nursery. Named the Tarantula Nebula, it spans 700 light-years. If it were as close as the Milky Way's well-known Orion Nebula, the Tarantula Nebula would loom 55 times larger than the Moon. Surprisingly, three recent studies, each by different astronomical teams, show that smaller galaxies rarely flourish close to a giant one; yet the Large and Small Magellanic Clouds sit only 160,000 and 200,000 light-years from Earth, respectively, which is nearer than most of the Milky Way's other galactic satellites. 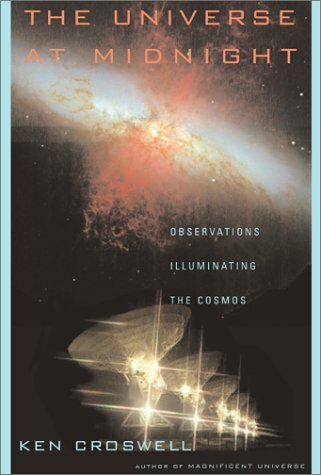 Astronomer Phil James at Liverpool John Moores University in England, co-author of one investigation, recounts what happened as he and a student were imaging distant galaxies: "One night, when we were both up at the telescope, it occurred to us, ‘What would it look like if someone were in one of those galaxies and looking back at us? What would they see of our Galaxy?’" They'd see the Milky Way, plus its two brightest companions: the Large Magellanic Cloud would look a tenth as bright as the Milky Way and the Small Magellanic Cloud a fourth as bright as that. James says, "As we went through taking hundreds of these galaxy images, we weren't seeing that very often." In fact, only a few percent of giant galaxies like our own host a close-in pair of star-forming satellites as luminous as the Magellanic Clouds. Andromeda certainly doesn't. It's the nearest giant galaxy to our own, 2.5 million light-years away, and the largest member of the Local Group. The Milky Way ranks number two, and all its satellites except the Magellanic Clouds have run out of gas—literally. Without gas, galaxies can't create new stars. Known as dwarf spheroidals, these gas-poor galaxies are so ghostly and diffuse that the first one found—the Sculptor dwarf in 1938—was initially mistaken for a fingerprint or some other defect on a photographic plate. The Magellanic Clouds’ flamboyance is astonishing because the first rule of survival for modest galaxies is to steer clear of the big ones. Through their great gravitational pull, giants like the Milky Way and Andromeda rob other galaxies of gas and thereby thwart star birth. Just as the Moon's gravity pulls hardest on the Earth's near side and lifts the sea, so a giant galaxy's tide tears gas out of another galaxy via what astronomers call tidal stripping. And when a small galaxy dodges through a giant galaxy's halo, halo gas hits the lesser galaxy's gas, knocking it out in a process called ram pressure stripping. That's why the typical satellite galaxy is dead, devoid of gas and bright young stars. 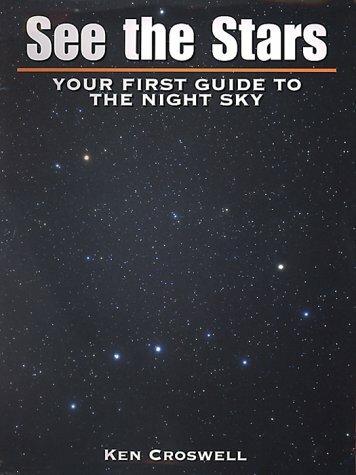 So how can the Magellanic Clouds shine, radiant and defiant—such stunning sights in the southern sky? Why are they there? 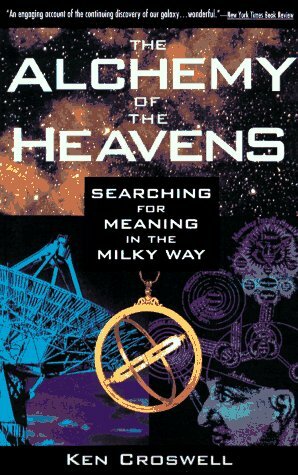 A series of studies from the Hubble Space Telescope is bringing the answer into focus. 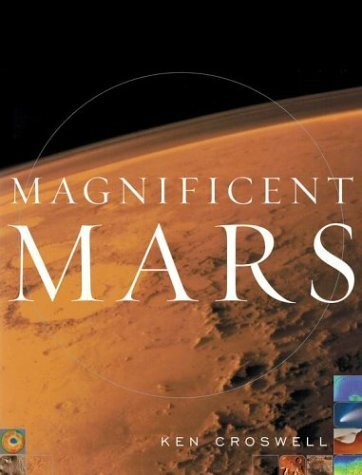 Seven years ago, Nitya Kallivayalil, an astronomer now at Yale University, and her colleagues reported Hubble observations that tracked the motion of the Magellanic Clouds through space and began to illuminate how the Clouds have prospered while their fellow satellites atrophied. And her latest Hubble data, published in February 2013, follow the galaxies over a longer period of time, yielding a more precise path for the pair, and strengthen her startling discovery: the Magellanic Clouds are speeding through space so fast they are likely passing us for the first time. "I was initially very surprised," she says. But her discovery actually explains how the two galaxies have retained their youthful glow. Until recently they've avoided the Milky Way and its gas-grabbing tactics. Before Kallivayalil's work, and before it became so clear that getting close to a big galaxy was bad for a smaller galaxy’s health, astronomers thought the Magellanic Clouds revolved around our Galaxy every 1 billion or 2 billion years. When the Clouds came closest, the thinking went, the Milky Way's gravity stirred up their gas, triggering the birth of new stars. The Hubble work, however, suggests that the Clouds' orbit around us is much more enormous. 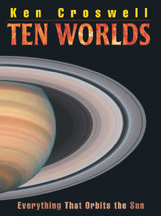 Indeed, Kallivayalil's new work rules out orbital periods less than 4 billion years. The two galaxies came closest to us just 200 million years ago; thus, for most of their lives, the Milky Way has had little effect on them. Instead, the Clouds owe much of their splendor to each other. The Small Magellanic Cloud has probably been dancing around its partner every few billion years, sometimes getting closer, sometimes getting farther. And 200 million to 500 million years ago, the Small Magellanic Cloud skirted past its larger sibling. "I think the Small Magellanic Cloud smashed right through the Large Magellanic Cloud," says astronomer Gurtina Besla of Columbia University, who has computed their past paths. She says the collision compressed gas and spawned many of the young stars we see in the Clouds today. But this fertility dance has come at a price. Besla says tides from the Large Magellanic Cloud extract stars and gas from its smaller sibling. In 2011 Knut Olsen, an astronomer at the National Optical Astronomy Observatory, and his colleagues reported the Large Magellanic Cloud has stars that aren't moving around the galaxy with its other stars. "I hadn't expected anything like this at all," Olsen says. The wayward stars' chemical composition matches that of the Small Magellanic Cloud, implying that the larger galaxy likely snatched millions of stars from its smaller mate. Gas is also spilling out of the two galaxies. Since the early 1970s astronomers have known that a long stream of hydrogen gas stretches away from the pair. The old thinking: the Milky Way's tide ripped out the gas. The new thinking: the Clouds themselves are to blame. In 2009 astronomer David Nidever of the University of Virginia discovered that this stream is even longer than had been thought, stretching over more than half a million light-years, so it encircles most of the Milky Way. Nidever suspects that bright stars in the Large Magellanic Cloud blow out gas through their winds and supernova explosions. Besla thinks, however, the gas stream flows instead from the Small Magellanic Cloud, torn out by the tide of its partner, which has ten times more mass. Either way, the Magellanic Stream traces the pair’s path through space, revealing that their orbit around us is polar, like a terrestrial satellite sailing over the North and South poles. The Milky Way will grab the lost gas to prolong its own star-making career. Indeed, never forget who's boss. The Milky Way is exacting tribute; its tide yanks the nearer galaxy away from its companion so that the Magellanic Clouds may never orbit each other again. They're already separated by 75,000 light-years. The Clouds' recent collision may have fractured the lesser galaxy, and Besla says its fate is bleak: "I think the Small Magellanic Cloud is on its way to becoming a dwarf spheroidal." To do that, it need only lose its gas, then wait for some future astronomer to mistake it for a fingerprint. Fortunately, that will take a long time. By venturing past the Milky Way only now, both galaxies still bear abundant gas to forge brilliant new stars that will deck southern skies for eons to come. 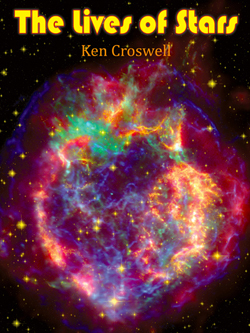 Ken Croswell earned his Ph.D. in astronomy from Harvard University for studying the Milky Way and is the author of The Alchemy of the Heavens and The Lives of Stars.